Food is an integral part of our lives. As families, we sit around the table to share a meal. In between classes and meetings we run to grab a quick slice of pizza or a sandwich if we can find the time. First dates are usually centered around a meal together. Even the holidays become a great excuse to eat our fill and then some while catching up with friends and family. But our obsession with food goes beyond just basic survival. It has become a social occasion and something to look forward too. But where does our food come from? Of course farming helps get groceries on the shelves and, eventually, our tables. However, the United States no longer gets a majority of its food from small family farms. Instead, because of our increased demand for food, especially meat, dairy, and poultry, we, as a society, have reverted to Concentrated Animal Feeding Grounds (CAFOs), more commonly known as factory farms. An example of a concentrated animal feeding ground. While this term may seem overused and more of an abstract idea as opposed to an actual place, the truth is that the animals that are raised in these factory farms for slaughter face horrible conditions and abuse on a daily basis. Most of these animals are fed a mixture of corn, grain, and rejected animal parts from fellow slaughterhouse animals that either died prematurely, were not large enough to package once slaughtered, or are just not demanded by the general public, such as cattle blood and poultry litter (Pluhar, 2010, p. 457). Calves raised for veal are kept in small cages where there isn’t even enough room for them to lay down with their legs outstretched or turn around (Pearce, 2011, p. 442). Cows frequently spend their lives standing in their own excrement and have their horns cut off without anesthesia to avoid them injuring other animals who live in such tight quarters. Pigs get their tails docked, chickens and other birds get their beaks cut off to avoid them pecking at themselves and others as the conditions slowly turn them crazed (Pearce, 2011, p. 442), and the list goes on. Countless well-known documentaries, such as Earthlings, Food Inc., Cowspiracy, among others have shown these conditions through undercover work and watching anyone of them can make one’s stomach turn. Despite this, our public policies are still incredibly lax in regards to how these farms are regulated and rarely do you hear public outcry to change such conditions or even phase away from factory farming altogether by means of public policy, as Europe is currently doing (Pluhar, 2010, p. 462). While culture influences our ever-increasing demand for meat and meat products, economic drivers have continued to influence factory farming. Due to such a large supply of meat that has been fed with cheap grain and crammed into a small space, prices remain low for consumers relative to disposable income (Pearce, 2011, pp. 438-439). In other words, “more animals means greater economies of scale and lower cost per unit” (Pearce, 2011, p. 438). However, the biggest problem with this is that the factory farming industry does not take into account externalities such as the negative effects to the environment, contributions to climate change, and the negative effects to human health. When it comes to environmental consequences, agricultural run-off from these farms remains a huge issue, especially in terms of animal waste. This proved to be a huge issue in North Carolina in 2016 after Hurricane Matthew flooded many hog and poultry farms (Hernandez, Fritz, & Mooney, 2016). As the flood waters receded, it carried with it tons of waste and dead animal carcasses back to the ocean, seeping into groundwater the entire time. But hurricanes are not the only way waste can get into the water supply. 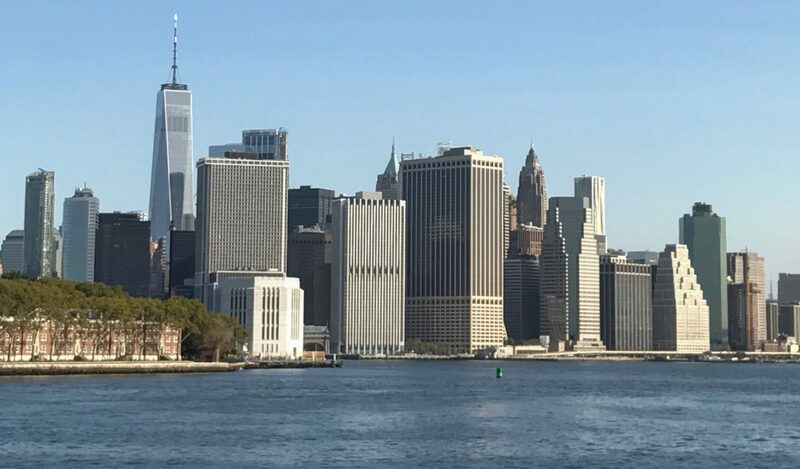 Just simple day-to-day activities, improper disposal, and lack of monitoring can lead to waste running off into the local rivers and water supply, causing illnesses such as E. Coli and Salmonella poisoning. To top it off, factory farming requires large patches of land, which can be traced back to our current land-use changes within the United States and the inefficiencies this causes (Bartling, 2012, p. 28). In addition, it is not news to anyone well-versed in climate change science that methane gas, which is released by cows when they flatuate, is a huge problem and can even pose a bigger challenge than carbon dioxide. Perhaps the most compelling argument against factory farming from an anthropocentric point of view is how bad factory farmed animals are for our health. Recall above that I mentioned many of these animals are fed a questionable concoction of grain, corn, and animal byproducts. The biggest issue here is that whatever these animals eat, we wind up eating further down the food chain. 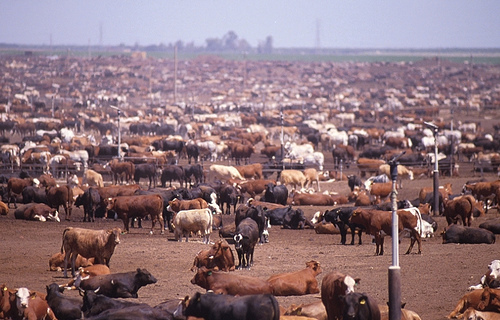 Little research has been done to show how this may affect human health directly but recent correlations have shown that many infectious diseases that can spread to human populations develop more readily in factory farms than anywhere else (Pearce, 2011, p. 452). Matters are also not helped by the fact that increased use of antibiotics in animals, which are used to minimize spread of disease as well as help these animals grow larger, has lead to many strains of antibiotic-resistant bacteria and viruses, thus compounding the ability for sickness to get spread among these animals while being packed in such close quarters. 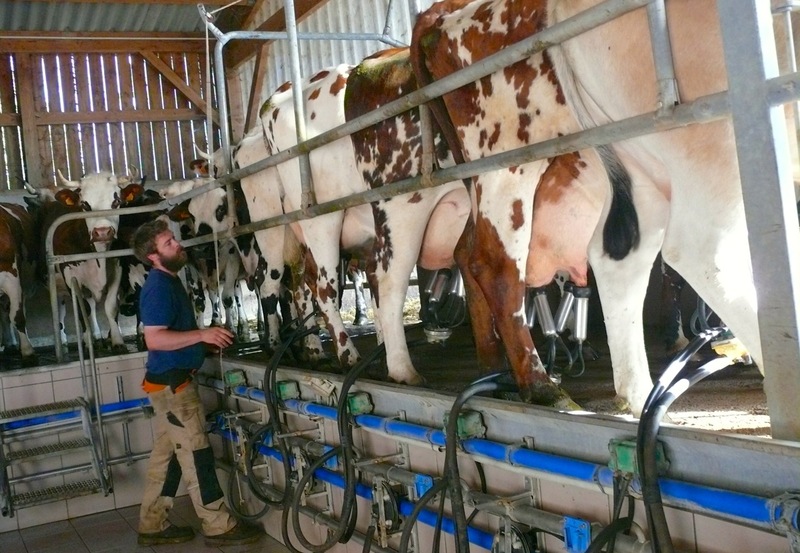 A milking parlor on a modern farm. 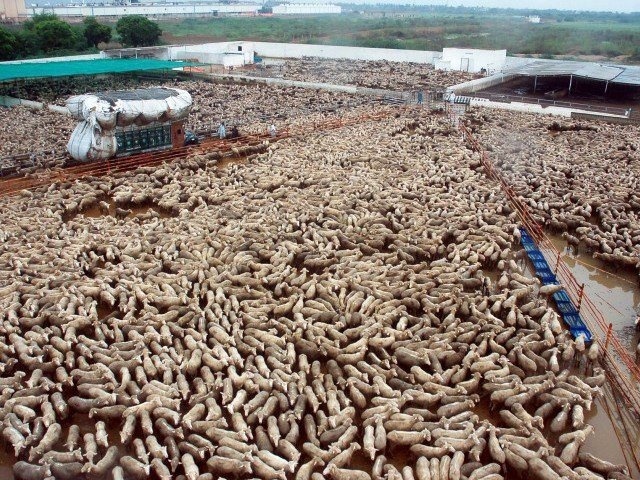 Currently, as a society, we are rather limited when it comes to “solutions” to factory farming. Several ideas that have been proposed include becoming vegetarian or vegan or simply cutting back on how much meat we consume daily, closing factory farms and reverting to old-style small, family farms that follow organic practices, and in-vitro meat, where cells of one animal can be grown in a laboratory setting into a single slab of meat, such as the muscle of a pig being grown into a single slab of bologna (Pluhar, 2010, p. 463). However, the truth is that our demand for meat and meat products is not going to dwindle anytime soon and the draw for people to become farmers is just not there anymore. To top it off, technology to develop in-vitro meat have not been advanced enough to the point that we can satisfy the world’s meat demand cheaply. However, as Prince Charles of Wales stated, “farms have been reduced to little more than factories and must be brought into greater harmony with the planet” (Starkey, 2017). While we will not stop our meat consumption anytime soon, we must find away to bring meat farming into greater harmony with nature if not just for the well-being us but also for the environment and the animals who are subjected to the cruelty of factory farming and I believe we can start by pricing this food while taking into consideration the externalities that it causes.